Vents, and a Thumbhole Grip. Note: Vents can be excluded at no additional charge--On Request Only. Select a Grade of Walnut, or Select a Laminate Color in the pricing tables. Choose the desired forearm width in the Laminate Color to determine the exact price. Walnut Stocks are available with a 2 1/2" forearm width only, so just select Grade and price. Please Note: Due to material limitations, stocks made of Walnut come with a 2 1/2" forearm width ONLY! Made of 1/16" stained Birch veneers. 18 Colors to Choose From! Click for photos! 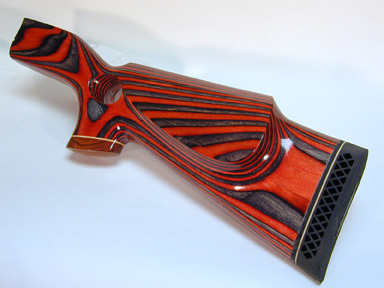 PLEASE NOTE: Target Style Stocks in Laminated wood are offered at a Flat Rate--No Dealer Discount. Custom Barrel Channel -- We can cut a 1/2", 3/4", 1", or 1 1/4" straight channel on request for custom barrels (Available for 96% inlets only). We cannot cut specific channel contours, or cut according to customer supplied dimensions. All stocks come with a standard small factory sized channel unless an optional straight channel cut is requested. NOTE: If paying by Credit Card the charge will be processed approximately two weeks prior to shipment.